Synopsis: There can be no straight road home. A young man is released from a Sydney prison, his hands empty, his identity gone. He catches a southbound train out of town, then hitchhikes west. He hasn’t been home for fifteen years. For days Frank rides the highway through an unforgiving landscape, surviving on what he finds and the kindness of strangers. As he edges closer to a home he struggles to remember, his boyhood looms. Out of the past, something is coming that will tear through his fragile hold on reality. 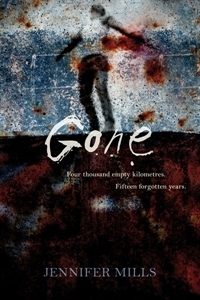 Chilling, haunting, suspenseful, Gone is a journey through one man’s splintered world. Review: This isn’t your typical roadtrip novel. Mills takes us on a psychological journey as we tag alongside the mysterious young man released from prison. He assumes the name Frank, collects some clothing, a backpack and sleeping bag from a Sydney charity service and then begins to head west. Thumb out to hitch a ride, Frank makes his way into the outback by accepting rides from a variety of folk with their own stories to share. Although, Frank is quite reserved and wants to leave his past behind, it seems his past has other ideas. We learn of Frank’s early experiences with his tough father and an older brother who made my stomach quesy. The fear and anxiety young Frank experiences about his brother is very realistic and to be honest his brother sounded like the making of a sociopath. When his father goes out for work one day and doesn’t return, leaving Frank at home alone with his baby half-sister Lizzie and the looming shadow of his brother, Frank does what he can to keep his little sister safe. It’s not until the very end of the story that Mills reveals what Frank is searching for, how his youthful life ended and how his adulthood will begin. What really stood out to me about this story was the Australian setting, the land, the people and the changing cultures of each passing town. I think this drew me in the most because I am planning a roadtrip at the end of the year from Sydney to Perth via the desert so I was completely immersed in the scenery and the outback experience. About the author: Born in 1977, Jennifer lives in Alice Springs. She was the winner of the 2008 Marian Eldridge Award for Young Emerging Women Writers, the Pacific Region of the 2008-9 Commonwealth Short Story Competition, and the 2008 Northern Territory Literary Awards: Best Short Story. Her work has appeared in Hecate, Overland, Heat, the Griffith Review, and Best Australian Stories 2007. She is a regular contributor to New Matilda. The Diamond Anchor is her first novel; she is currently working on her second. Her website is www.jenjen.com.au. Previous postGuest Blog Wednesdays… Meet some aussie authors!